Alice in wonderland. The last game I played with this theme was the ingenious Winter Tales, a narrative game with a lot of crazy characters from the the book by Lewis Caroll. 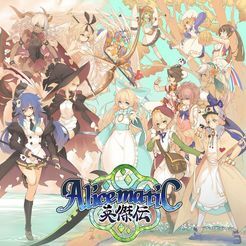 Alicematic Heroes by Japanime Games is a totally different game, but it uses characters from the book too. Of course there is Alice. But wait: it is not Alice, it are Alices! A spell from the Queen of Hearts (who else) went wrong. Instead of summoning one Alice, she mistakenly summoned whole armies of Alices! What a mess! Too much is too much. That can' go well. We all now that Alice is a brave girl with a lot of daydreams. So with all her dreams she is capable to stand against the Nothing. But now, all Alices want to improve the world, and soon after they begin to form teams that compete against each other to be the best one in improving the land again. And thus a real battle in Wonderland has begun. 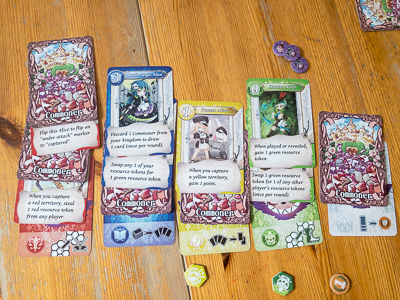 At setup each player takes over one of these teams, and is equipped with a starting hand of 5 Alices cards. But Alicematic Heroes is not a pure card game. It is played on a board that is randomly built up by different map tiles, so each game is slightly different from the one before. 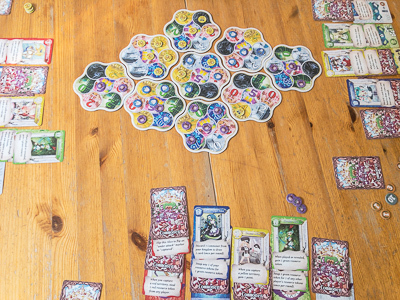 On his turn the player can pick any map tile to invade, and it is the players' aim to control most of the territories in the end of the game. Well control is not the right expression. What counts is the improvement of the land, but in the end that amounts to the same thing. So on the one hand Alicematic Heroes is an area control game with each map tile consisting of 7 territories. The player who controls most of these territories also controls the map tile, which is important in the final scoring. At the beginning of the game, each player possesses only two of these territories. All other territories are still free. Then, in the game, a territory is invaded, if a player is able to raise enough military power. If however, he is attacking from a distance (without an connection to territories he already controls), he also is in need of food and food to reach these lands. A player's turn is divided into tow steps: First of all there are the politics. In this phase a player can summon an Alice to his Kingdom. Each kingdom has five different slots for military power, population, dream power, food and order. Sending Alices to these slots increases the power in the different categories. And thus you get stronger, and can invade more and more lands, while on the other hand get more and more bonuses during the capturing. To summon an Alice you need Dream power at least equal to the strength of the new Alice card you want to play. The power is simply equal to the number of cards already lying in this slot. 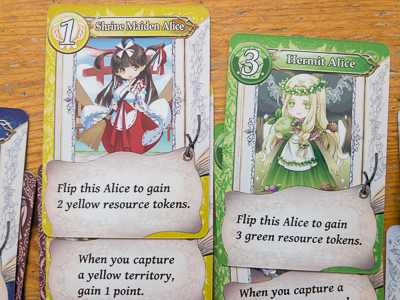 But Alice cards also have their individual power that takes effect immediately after the card is played. Some cards have permanent effects, but there are also some mighty cards with single effects,, and it is essential to use the powers of these cards at the very right moment. Alices can also be played faced-down, as Commanders, if you don't have enough dream power to summon them. In that case they count to the slots number (and thus to its power), too, but the individual power of that Alice doesn't take effect. In the second step of a player's turn, it is time to invade the land. You can evade nearly every territory on the map, but you must at least reach its invasion difficulty with your current military power. And, in case you don't have connection to that land, you also have to provide your armies with food (again the number of cards in the corresponding slot). But what can you do, if you don't have enough strength (and/or food)to conquer a land? Well, that's also possible and quite easy: You just take your time and do the invasion in two steps. In the first round you place the territory under attack (the territory marker is placed face down). If, in one of the following rounds, you are attacking the same territory again, it is finally conquered. But of course your plans become visible before. And so your opponents might be quicker and you might come away empty-handed. Capturing territories gives the players bonuses for the further game. 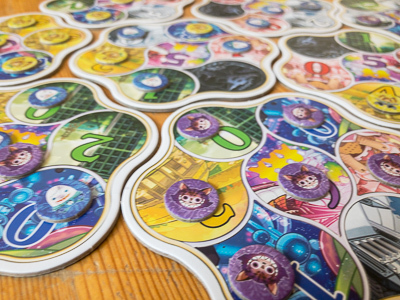 Depending on the type of the territory, the bonus is either a resource token that can be used to increase the power in one of the stats, or it lets the player draw new Alice cards or take victory points. The number of cards and victory points is again determined by the number of cards in the corresponding slot. The game ends after the 14th round with a final scoring. Next to the majority on each of the map tiles, there are bonuses from Alice cards and the majority of Alices in each of the five powers. Alicematic Heroes is an easy, fast playing area control game. It is no heavy brainer, but you still have to think a little bit about your invasion plans. And you should always keep in mind your individual Alices powers as well as the ones of your opponents. If you are invading too far from your invaded cities (the centre of each map tile is called a city), you can easily loose your lands again, because they are no longer save from other player's Alices armies. .